Purchasing a t-shirt from the Fort Allen Fire Hall will help the families in need. The shirts are on sale for $10 at the Fire Hall. Sometimes it takes an act of God to bring people together. In the case of Fort Allen, a tornado brought the entire community together in light of the tragedy on March 23. Although this wasn’t anything compared to Japan’s tsunami, the tornado still left several families homeless. There are 13 houses deemed uninhabitable due to tornado damages. On Sat., March 26, volunteers from all over our community, including some Seton Hill University (SHU) students reached out to help the tornado victims. Volunteers gathered at the Fort Allen Fire Hall to give back to their community members. According to Ricky Smail, one of the volunteer fire department members, the fire hall received so many volunteers that they had trouble finding work to be done. Community members also came together to make sure the families who lost their houses had enough food to eat through the tragedy. I live literally three houses away from Hempfield High School (HHS). That may not be the best way to describe the distance, but that’s exactly how it is. I can see Harrold Middle School (HMS) from my bedroom window; its football field connects to my back yard. I can also see the high school from my living room window. My family was one of the lucky ones. I wasn’t home when the tornado hit, but minutes later I received a phone call from a neighbor who was away at college telling me that a tornado just went through our back yards. I can tell you right now- nothing compares to the feeling of dread, and the question of whether or not you’ll have a house to go home to. My pets, my clothes, my bed, my school work—everything could have been gone. As I rushed home four fire trucks, two ambulances and several police cars passed me on Route 136. As I drew closer, I grew increasingly uneasy, because all of the emergency vehicles were traveling in the same direction as myself. At this point, I didn’t know the tornado had touched down at Hempfield High School or that it had ripped part of the roof from the school. When I got home, I found our house safe and sound. Apart from some minor damage and some debris in the back yard, my house was fine, as was everything in it. I can’t say the same for the trailer that used to be 50 yards behind my house—bits and pieces were littered in HMS’s football field as well as in the trees in my back yard. Thankfully, no one lived there anymore. The same can’t be said for the houses on Fosterville that were destroyed or the farm out on Adamsburg Road that sustained damage to its barn as well as its pastures. Since the tornado hit, there have been lots of efforts to clear up the debris. By Sunday, the trailer debris behind my house was cleared away. The church and school house behind the football field that lost its roof had a temporary tarp placed to prevent further weather damage. 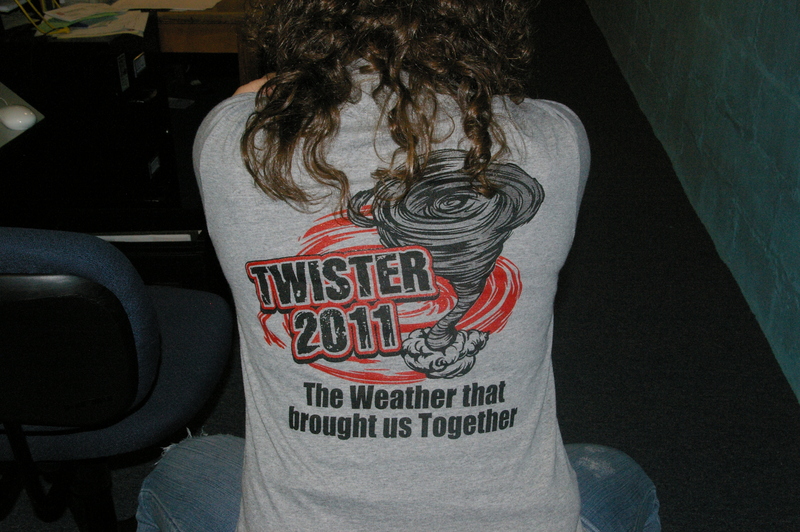 The Fort Allen Fire Hall is now selling t-shirts to benefit the families who lost their homes from the tornado. The slogan “The weather that brought us together” expresses exactly what this tornado did for the Fort Allen and Hempfield community. It reminded us to be supportive of our neighbors in need.